Foam | How can I recycle this? Unlike its foam ‘peanuts’ counterpart which can be reused as multi-purpose packaging again and again, the moulded stuff only really fits around the item you got it with — but there are still some fantastic ways to reuse it. Chunks of expanded polystyrene foam make great crocks for plant pots – particularly large tubs filled with shallow rooted plants. The light foam fills the space rather than heavy soil, making it easier to move around and it helps with drainage too. Those worried about plastic chemical leaching may want to avoid using it when growing fruit or veg in containers though. 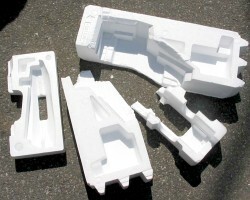 Waste expanded polystyrene can be used to make fun artwork – it can be used as a core for sculptures or models. Flatter sections can be used like poster board/foam core to mount pictures, photos or posters on walls – the resulting picture is rigid (so won’t curl) but light. Deeper pieces of the foam can be used to make blocky canvas-style wall art – mount your picture so that it run around the edges, covering the foam sides. If you haven’t got a single piece of polystyrene that’s big enough, make a strong frame from lengths of it instead. Pick a reasonably smooth piece of expanded polystyrene and cover it with a quick drying fabric – thin cotton or an old swim suit perhaps – to use it as a floating pillow in the bath. Or cover smaller, interesting shapes with fun fabric to make floating toys for kids. As it’s light, bulky and reasonably easy to modify, it’s perfect for turning into Halloween or fancy dress costumes where you want to be bulkier – or more robotic/mechanical – than you currently are. Coldframe – moulded expanded polystyrene boxes are great as cold frames in the garden as they protect delicate seedlings from the cold earth. They’re commonly used for shipping refrigerated vegetables or chilled/frozen fish so ask at your local market to see if they have any spares. Then you just need an old window or some scrap clear plastic sheeting for the top. Ponds – if you’re installing a pond, consider placing a layer of expanded polystyrene around the liner and the earth. 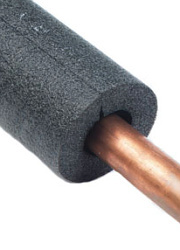 It’ll stop the cold earth leaching away the water’s last bits of warmth in the winter. You can also float the foam on top of the water in winter to stop it freezing solid – and in the summer, frogs can use polystyrene floats as mock lily pads. “Hay” oven – a hay oven allows you to save energy while slow cooking stews & casseroles. You start the casserole on the stove then cover it and put it into a well insulated box for several hours – the retained heat keeps it hot and cooking. As the name suggests, hay is a common insulator – but expanded polystyrene can perform a similar job. Try to avoid buying items packed with expanded polystyrene in the first place. Support more environmentally conscious manufacturers who uses paper based alternatives instead. And if you do, tell the original company why you didn’t buy their product – it might inspire them to be greener in the future too. 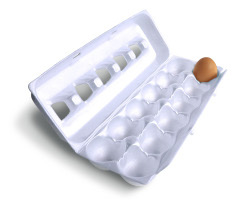 How can I reuse or recycle plastic/foam egg boxes? I’ve seen all the ideas for paper egg boxes but I get plastic ones sometimes. I can’t even compost them!! What can I do? The first suggestion I have is possibly a little unhelpful but “reduce” – don’t get the plastic ones any more. As I said, that’s probably a little unhelpful because I’m guessing that you wouldn’t get them if you had a choice but still, it’s always worth reducing if you can. One advantage foam boxes have over cardboard ones is that they’re not so easily damaged when they get wet so they’re better for certain reuses – I remember using them as colour palette while painting as a kid. They can also be reused many times for their intended purpose – offer them to chicken-owning friends or take them with you to use when you buy eggs from somewhere that sells them loose (such as certain farmers’ market stalls or markets in general). Any other suggestions specifically for foam ones? 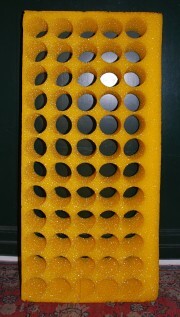 How can I reuse or recycle giant holey foam things? From a party project, we have left two big foam “things” with holes in it. See the picture included. They measure 108 by 47 by 18 (in centimeters). The holes are large enough to hold a winebottle. 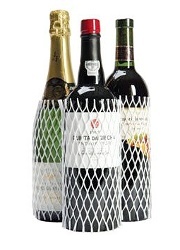 But the foam is quite soft, so it’s not safe enough to make it into a hanging wine rack. I thought about it being playing items for the kids in the garden, but any better ideas are more than welcome. The bright colour, softness and chunkiness make them feel very much like something for kids – one of those things that if we’d had it as a kids, we’d have come up with a thousand different play uses for it. If you have a few, another kid-related thing might be to string them up as hanging dividers in a bedroom – such as between the sleeping area and the playing area, or to give kids a little privacy/sense of their own space in a shared room. Aside from that, if you could find boxes big enough to hold them (under bed storage boxes maybe? ), they might be useful for keeping glasses or bottles safe during a house move (if you’re not moving, someone on Freecycle probably will be!). They also could be useful in the garden if you’re growing a lot of seedlings – holding plant pots upright when they start to get a bit top heavy or if it’s windy.